LAS VEGAS (AP) — Brad Keselowski raced to his third consecutive NASCAR Cup victory Sunday, persevering through a wreck-filled Sunday afternoon and roaring away from the field in overtime to claim the playoff opener. Keselowski secured team owner Roger Penske’s 500th victory across all competitions with a resourceful performance amid trying circumstances and 99-degree Las Vegas heat. Kyle Larson was second, and defending Cup series champion Martin Truex Jr. third after a stop-and-start finish to a race that featured 12 cautions. Eight of the 16 playoff drivers had various problems in the opener of the 10-race postseason. Four playoff drivers failed to finish — including co-leader Kevin Harvick, who wrecked with 120 laps to go when he blew his right front tire. Michael McDowell and Kurt Busch wrecked with just two laps to go, forcing a red-flag stop and overtime. 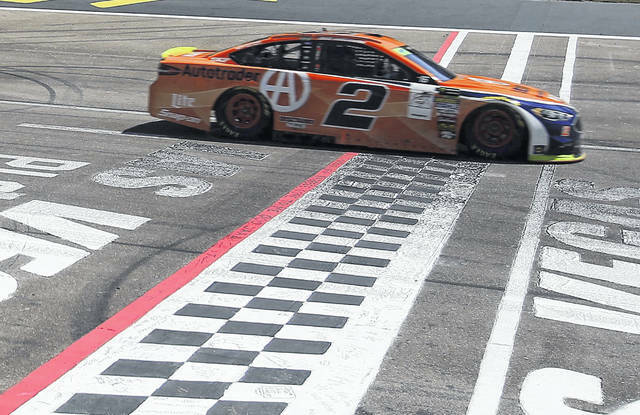 After the drivers re-fired their engines for the two-lap shootout, nobody could keep up with Keselowski’s Team Penske Ford. Penske was in attendance for his landmark victory at Las Vegas Motor Speedway. He formed Team Penske in 1966, and it has fielded 50 winning drivers across 14 race series during the ensuing 52 years. Keselowski won at Darlington and the Brickyard in consecutive weeks before Vegas. His late surge has added some intrigue into a NASCAR season dominated by the Big Three of Truex, Harvick and Kyle Busch, who finished seventh in Vegas even after skidding and plowing through the infield grass with 35 laps to go. Joey Logano finished fourth, and Ryan Blaney was fifth. Harvick’s blowout also wrecked pole-sitter Erik Jones, who couldn’t react quickly enough and rear-ended Harvick. Las Vegas has a second race this season for the first time, and the drivers learned that the track is much different in the waning days of summer. The temperature reached only 58 degrees during the annual March race, but the drivers were sweating in 99-degree heat from the start on Sunday. The desert sun made the 1 1/2-mile track even slicker than usual, and it appeared to wreak havoc with some teams’ tire pressure decisions.